C Worthy | B2B Copywriting | Marketing collateral for B2B technology companies and service firms. Written and polished to your satisfaction by an experienced B2B writer who understands how to use marketing content. Designed to focus our combined efforts on developing crisp content instead of haggling over billable hours. Attained by writing effective B2B content for dynamic companies like yours, targeted at customers like yours. Are you sure it's cheaper to write it yourself? B2B marketing content such as white papers might be costing you more than you think. 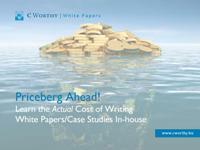 Read this free ebooklet to learn about the hidden costs of writing content in-house. Copyright © 2014 C Worthy White Papers Inc.